The entrepreneur was helping to launch the three-day event in China – where leader Xi Jinping has made a so-called "toilet revolution" across the country a policy priority. The technology giant pointed out the jar of faeces beside him could contain "as many as 200 trillion rotavirus… 20 billion Shigella bacteria, and 100,000 parasitic worm eggs". 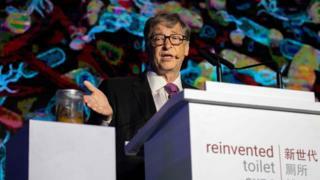 "You're only going to pay hundreds of dollars for a toilet – if it's really fantastic maybe $500," Mr Gates told the BBC. "You're saving all the costs of the waters, the processing products, but we have to bring it down by almost a factor of 10 from what the models are like – but that's not atypical for new product markets."